In this article we’re going to take a look at how we can test React applications. Typically applications built with a frontend framework are difficult to test; it’s tricky to emulate the actions of your users in testing, despite it being one of the most important things to test. If your tests can’t emulate what a user might do, it’s going to be tricky to have full confidence that your application works fully. Thankfully due to React’s nature it’s much easier to test when compared to other frameworks. Because React is built on the idea that your components take properties and state and produce HTML, it’s much easier. You can set up your component and assert that the outputted HTML is what you expect. In addition, as we’ll see, React provides some really useful test utilities that make it trivial to simulate user interaction and ensure that things are functioning as expected. 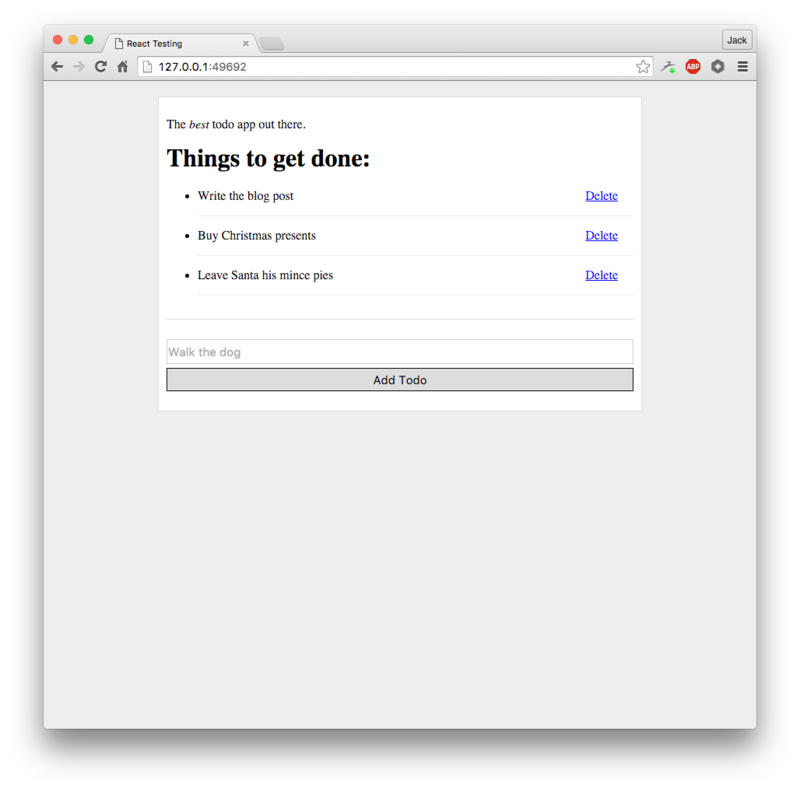 As an application to work with, I’ve picked a unique idea and built…a todo app! This might not be the most exciting idea ever, but it does let us build some functionality that we can test, and it’s an idea everyone is very familiar with. When you’re working on a small application it’s very easy to manually test that everything is working, but as your application grows and if more people start to work on it it’s impossible to have confidence across your entire application. Testing might seem like a waste of time at first, but once you become quicker at writing tests and used to it, you’ll thank me! I’ve also recorded a video that demonstrates the functionality of our app. It lets you toggle todos being done, add new todos and delete todos too. There’s nothing revolutionary in the app but it will provide a nice base to test from. You can grab all the code on GitHub too if you’d like to run it locally. 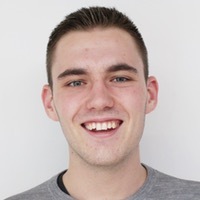 I’ve written the entire application in ES2015 using Babel. I’ve installed all our dependencies through npm as Node modules and webpack converts those into client side compatible files that combine to run our app in the browser. The nice thing about installing all our dependencies in Node is we can then use all those dependencies again in our tests. Additionally, running our tests in NodeJS rather than in the browser means we can avoid the complexities of running in a browser and run them entirely in the terminal. My testing library of choice for NodeJS is Tape. Tape has a minimal API that I find helps to keep tests clear and leads to better assertions. Eric Elliott’s post on Tape does a great job of summarising the reasons why Tape is a good choice, and hopefully I’ll demonstrate them as we move through the article. It’s worth noting that we’re using Tape as a test runner here; if you have another preferred choice you could easily swap it out at this point. I’ll also use Babel Tape Runner, a small module that configures Tape and Babel nicely. Finally, we’ll be using jsdom because in some of our tests React will expect to be within a browser, and we can use jsdom to fake out a browser in NodeJS. Let’s get started by installing all those as developer dependencies. If you want to follow along you can checkout the first commit on the demo repo which doesn’t have any of the testing libraries installed. I’ve already got Babel and its presets configured but let’s quickly cover it. We need Babel and two of its presets, es2015 and react, to ensure everything is transpiled as we need. This will get tape to run any files in the test directory that are suffixed with -test. It renders the Todo correctly – we’ll test this by checking the todo name property is rendered. When a todo is done it gives it an extra class of done-todo, which causes the strike through. When a todo is clicked on it is toggled. When the delete link is clicked it deletes the todo. We can test 1 by rendering the component and looking for the text we want. 2 and 3 are tested by triggering clicks on the HTML and checking the right callback is called. Note that whenever we test React components we will test them by simulating user interaction, rather than by writing code to set state as if a user had clicked a button. You should try to always avoid reaching into a React component to set its internal state, and make sure all your tests act as a user. When testing React components, the input is user action, and output is the rendered HTML. The TestUtils are fully documented on the React docs, and I recommend getting familiar with them. We’ll use a few methods in this tutorial. Tape works by providing a test function that you call with a description and a callback, which Tape will call with an argument, which is commonly referred to as t. This is the object that you assert on or call test on to nest tests. In this test we first create a new todo and pass it to shallowRenderTodo to get a fake object that mirrors what would be rendered to a real DOM. Note the call to t.plan, Tape requires you to tell it how many assertions you’re going to make. I’ve actually found this a really nice way to self document, and it also means Tape works with async tests out of the box – it will simply wait to allow async tests to execute. This structure might seem a bit alien, but once you get used to working with React components that have been shallow rendered you’ll be more familiar with it. Any child elements are always contained within props.children, so all we’re doing above is going through the tree of the React component to find the text that was rendered. Now, let’s render a todo that is completed and check that it does have the correct class applied. Finally, we’re ready to run the tests! You should be able to run npm test to see the results of our work. Whilst the output from Tape isn’t the most beautifully formatted, it follows the TAP protocol. This means that there’s lots of formatters available to take the above results and turn them into something that looks much nicer. Some of my favourites are Faucet and Tap Prettify but you can find a comprehensive list on the Tape GitHub page. The good news is that all of our tests are passing! Next, we can write a test that ensures when we click on a Todo to toggle it between done and incomplete the right callback is called. If you recall from looking at the implementation of the Todo component we give it a property that it should call when a user toggles a todo. We’ll test that when we click on a todo the component does call that function. This time though we’ll be rendering into the DOM and simulating user interaction. Using renderIntoDocument from TestUtils we can take the component and render it into the DOM. Note that each renderIntoDocument renders into a detached DOM node, which means no one test can interfere with another. I pass the component doneCallback, which is a function that takes in the ID of the todo and makes an assertion that it will be equal to 1, which is the ID of the given todo in the test. If this callback never gets called then Tape will detect that we haven’t made all the assertions we planned and the test will fail. And with that all our Todo component tests are complete, and passing! This might seem like a lot of effort, and a lot of new functionality to learn, but the good news is that most React component tests will follow roughly this structure. Once you gain familiarity with the React test utils they will have you covered. Now we’ve covered a lot of the basics we’ll move at a little more speed through the rest of the tests. As you can see this structure matches the other tests pretty nicely. The only change is we now reach into the DOM twice to manipulate different elements. In the first case we grab the input and update its value to Buy Milk, as if the user had typed it in. Then we find the button element and simulate a click on it. This causes todoCallback to be called, which asserts that the object it was given has a name property of Buy Milk. The best todo app out there. In this case I’ve hard coded our state with three items, but you can imagine that this might instead come from a database or API request. The Todos component is the only component that knows how to update the state, so it has methods called toggleDone, addTodo and deleteTodo that do just that. When it renders the Todo and AddTodo components it passes them a callback function (the ones we tested earlier) that trigger the methods that cause changes to the state. The tests we’ll write for the Todos component will be a little more overarching – we’ll test that when you add a new todo item, it is indeed rendered and the length of the ul containing the items changes from 3 to 4. Rather than just testing a callback we’ll actually assert on changes to the DOM output. The first test will test how many todo items it renders. We’re expecting there to be three, to match the initial three we have in the state. Once again we can do this using shallow rendering – avoiding a “real” DOM render whenever possible is encouraged. // more tests to come! Next, let’s write a complete test for testing that we can mark a todo item as done. To do this we’ll simulate a user clicking on a todo item and then find that todo item in the DOM, asserting that it’s been given the class done-todo. So you can think of it as looking into the DOM to see what we might find. Thanks to @darkliquid on Twitter for clarifying that to me! In our case we only need the first toggle button (there’s no reason you couldn’t use the second or third if you wanted), so we just grab the first item returned before simulating a click event on it. Finally I then use findRenderedDOMComponentWithClass to pull out the todo with a class of todo-1 (each todo gets a class based on its id), and then assert that it has the done-todo class using the classList API. An important note here is that findRenderedDOMComponentWithClass expects there to be just one element found, and will error if there’s 0 or >1 items found. If you need to find an element where you’re expecting multiple instances, use the scryRenderedDOMComponentsWithClass alternative. Occasionally we might want to run the tests in a browser to ensure that everything’s working not only in Node, but in Chrome, Firefox or other browsers. Thankfully we can do this using Browserify to first compile our tests into a client side bundle that we can then pass to tape-run to execute them in a browser. Tape Run by default runs the tests through Electron, but you can configure it to run tests through Chrome, Firefox or other browsers. "browser-test": "browserify test/*-test.js -t [ babelify --presets [ es2015 react ] ] | tape-run"
This script takes every test file, runs them through Browserify (using Babelify to transform the files) and then runs them in the background through Tape in a browser. If you run npm run browser-test and give it a few minutes, you should see the same Tape output in your console. You can try it again but add -b chrome or -b firefox to the end of the above command to run against a specific browser, which is really useful if you get reports of a browser specific bug. Generally I’d recommend running tests in Node in regular development and test them in browsers now and then, perhaps before a deploy. What you might have noticed so far is that we’ve not directly tested any of the logic for manipulating the state. We’ve assumed that the state is manipulated correctly given differences in the rendered output. However, when working with functions that manipulate the state it’s really useful to have unit tests that cover them. This makes it easy to test them quickly without having to wait for the tests that fire up your components. Our Todos component has a few functions that could do with some testing. This was going to be the end of this article, but as I was half way through writing it AirBnB released enzyme, a library that makes testing React components much easier. It looked really interesting and something I was keen to have a play with, so I thought I’d use this as a good chance to rewrite some tests in it and document how it goes. We won’t go into huge amounts of detail on this because I could write an entire article about it, but let’s rewrite some tests and see how it goes. You can check out the Git commit where I rewrote all the tests. Notice how much cleaner that looks! Rather than continue with these tests, let’s find another test that does use the DOM to see how Enzyme makes that much easier for us. We use mount to render the component into the DOM which returns an object that has the Enzyme methods on it. We can use that find method once more to locate the anchor we want to click. We then use Enzyme’s simulate method, which takes a string argument that’s the type of event we want to fire. Notice how succinct this approach is; Enzyme does a great job of making tests much more readable and clean. Under the hood it’s still using the methods that we used when we directly used react-addons-test-utils, so it’s well worth you being aware of them, but Enzyme adds a lovely layer on top. I hope this article has given you confidence to go forth and test your React applications. In this article we’ve looked at not only how to test your applications but also why – the benefits of doing so really pay back in the long run, even if at first it might feel a little over the top. The common complaint is that you end up writing twice as much code, the implementation and the tests, but this will save you accidental bugs and broken deploys a-plenty. It might sleem slow at first but once you get familiar with the concepts of testing and your tools of choice, you’ll speed up and eventually start wondering how you ever coped without testing! I highly recommend further exploring the Enzyme library by AirBnB, the functions that it exposes make it much easier to test React components in a more succinct way; it uses a very ‘jQuery-esque’ syntax and should help read React tests and understand what’s going on. It’s a great wrapper around the React test utils and one that’s worth your time to learn. If you have any questions you are welcome to ping me on Twitter or raise an issue on the GitHub repo and I’d love to chat. Finally, huge thanks to Mateusz Zatorski for his time reviewing this post, and to the entire 12Devs team for letting me take part once again. excellent post! Its nice to see more and more React specific testing tutorials and blog posts, considering how sparse the basic test utils are. Also if you like Enzyme, you might also enjoy https://github.com/jquense/teaspoon which has the same sort of approach but has been around longer so is a bit more mature and feature rich. we wrote it to scratch an itch with caused by the inadequacy of the default utilities. Its really nice to start seeing more and more high quality testing tools for react, its been a confusing neglected space for a while it seems. Great article, very good intro into unit testing! However, following it closely I found a small typo. It’s in the Todo component and you fixed in the second commit if I am correct. Anyway, I started from the first commit as the article explains and run into trouble testing the todos component. The test ‘Marking a todo as done’ expects a single todo ‘p’ tag to have class ‘toggle-todo’ and the parent div to have also the class todo.id. Looking at the git commits I found the correction and now the tests pass! Bringing the things learned directly into practice here! Looking a bit further into the following git commits and reading about enzyme I wonder it is worth it to write my tests using TestUtils. It seems that with the jQuery syntax of enzyme directly starting with that will be much easier. On the other hand, just doing it once with TestUtils probably makes me even happier that enzyme was created, right? Cheers and thanks again for this very nice tutorial!!! hey jack! i was brand new to unit testing in react, and your article got me up to speed in an afternoon. i’ll be moving forward with tape + enzyme for my work. 1. a year later, would you recommend any modifications to your testing stack? anything you have learned which would have changed your writeup? 2. i work at a really small startup (2 devs right now). my co-worker recommended selenium for testing the ui. would it be overkill to use both tape/enzyme AND selenium? do react-addons-test-utils and enzyme replace selenium?